DutchCrafters Solid Pine Wood Farmhouse Hutch offers plenty of storage space at 50” wide and 74” high with four doors, three drawers and open shelves. The wood shelves in the hutch top have plate grooves and make a perfect spot to show off your cherished pottery or china. 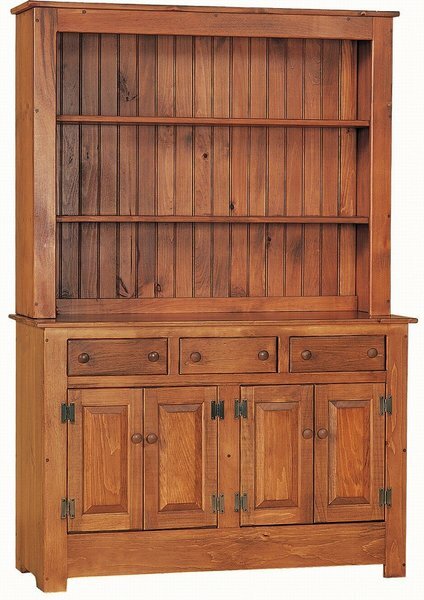 This farmhouse hutch is the ideal choice for the dining room or kitchen and is sure to become the focal point of the room. Stain the hutch to match your existing furniture or paint it to make a statement pieces. Two tone painted and stained finishes are also available. Order our pine farmhouse kitchen table to have a perfect matching dining set. This farmhouse hutch is a reproduction of the hutches from early Colonial times. You can bring a feel of the past into your kitchen or dining room without the cost of antique furniture. Please call with questions on our pine furniture or visit us at our Amish furniture store in Sarasota, Florida. If you don't see what you are looking then we can have it custom made just for you to your specifications. Top Shelf Depth: 10 5/8"
Height from buffet to first shelf: 12 1/2"
Height between other shelves: 11"
Great delivery crew (led by Jake), too. Thank you to the entire Dutchcrafters team for filling our Christmas wish! I wanted to let you know that I love my hutch and it is every bit as nice as I had hoped it would be. After all the upset over waiting and complaints, I am very happy with it, I'm just so sorry that the first one was damaged. I also want to let you know that the couple that delivered it were very nice and patient while we checked it over, but most of all they were on time - and I mean exactly on time! You've been very helpful and patient throughout the whole process. Got our hutch last week and we LOVE it! Just trying to find the perfect metal knobs to replace the wooden ones, to customize it a bit. Our other furniture has the black wrought-iron type knobs and handles.